Trust me, I get it. Money’s tight for a lot of us, and when you plop down $3.99 for a twenty page comic, you expect it to at least be worth the cost of admission. It’s easy to buy a monthly title just because you always have. It unconsciously becomes more about the routine than the book itself, and inevitably gets to be frustrating when you keep buying the book in spite of your waning interesting in it. Some readers understandably turn to the act of “trade waiting,” or foregoing the purchase of a monthly title in favor of the more affordable trade paperback. Still, the monthly comic book holds potential that isn’t always appreciated in these jaded times. 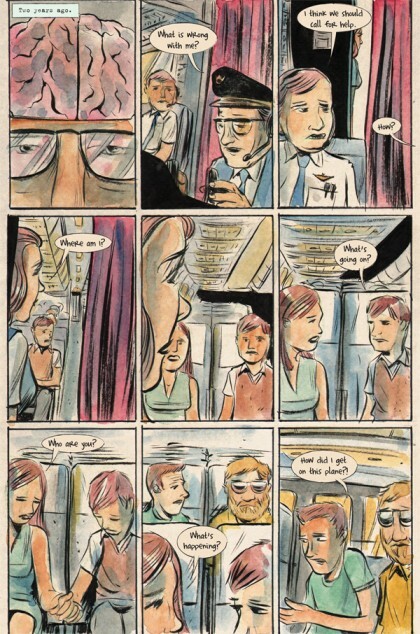 Here’s a brief look at what I think is one of the most underappreciated, innovative monthly comics on the stands today: Matt Kindt’s Mind Mgmt. 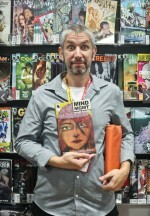 Kindt is a writer/artist who has largely worked on longer form graphic novels thus far in his career. He’s received due acclaim for books like Pistolwhip, Superspy, Revolver, and my personal favorite, 3 Story: The Secret History of the Giant Man. I was admittedly surprised when I heard that he’d be tackling a monthly series. It’s important to note here that Kindt isn’t just writing and illustrating each book, but also providing watercolors for each issue, and designing the entire project. So why undertake a project that requires such a huge amount of work at this point? Kindt has mentioned in a few interviews that he wasn’t really reading many monthly titles on an issue by issue basis, and started thinking what it would take to get him to read a book with that kind of regularity again. Rather than just think about it, he went about creating that book. Mind Mgmt is full of ambition, not only in the sheer amount of work that Kindt is producing for the book, but also in the ways he really tries to make the monthly comic a full experience. In addition to the painted artwork and twisting plot, Kindt places clues in each issue that astute readers can use to find out further details of story, along with hidden codes that can unlock web-based material that might further enrich the experience. Furthermore, each issue contains original material (on the inside of the front and back covers) that is exclusive to the monthly title. That is, the material won’t be reprinted when the book is collected in a trade paperback. While Mind Mgmt isn’t the first title to do this (Ed Brubaker has also championed this line of thinking over in Criminal and Fatale), it’s worth mentioning that this isn’t solely supplemental written material. 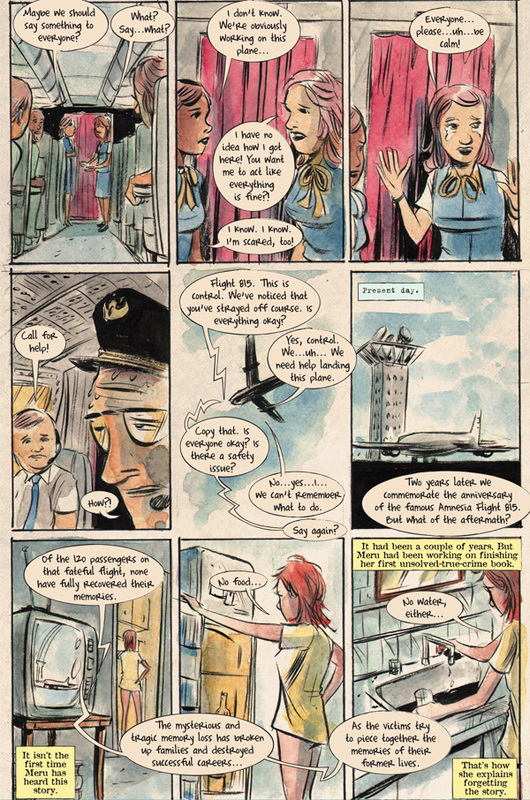 These extra strips are not only written and illustrated by Kindt, but further unravel the story’s plot and history. What’s all this signify? 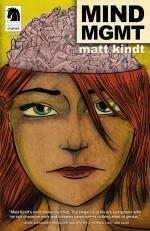 It lets you, the reader, know that Kindt is putting a lot of effort into the form of the monthly comic. Yes, it’s a $3.99 comic, but it’s one that offers a range of new possibilities every month, and they’re ones worth returning to. In my humble opinion, one of the greatest strengths of Kindt’s work is that it holds up with multiple readings. I find myself going back to read his graphic novels on a regular basis, and Mind Mgmt is very much the same kind of read for me. The plot is full of layers, and succeeds by being a thinking person’s comic that doesn’t get bogged down by excessive dialogue or interior monologue. Mind Mgmt throws you straight into the frying pan and never relents. Plot wise, this series deals with a conspiracy-laden case of mass amnesia among the passengers of an airplane, and an investigator named Meru who has more connections to the case than simply wanting to solve it. Like many of Kindt’s previous works, there are some science fiction elements here, but they unfold like a well-paced novel or film. There are artists who eventually start writing for themselves, but to Kindt’s credit, his books seem to have a well-maintained balance between story and art. In other words, you can enjoy Mind Mgmt on the merit of both its words and pictures. 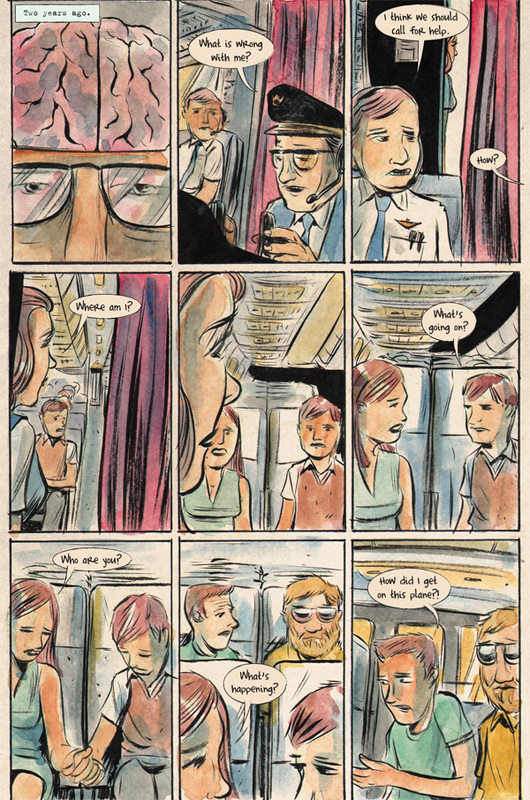 If you are among those who find yourself frustrated with monthly comics, I’d implore you to give Mind Mgmt a try. It’s true, you will get a rich story, art different from just about every other comic on the shelves, and plenty of supplemental bonus material. More than even that, you’ll get a monthly title from a creator who’s putting lots of time, energy and heart into the monthly format. These are books that we should be championing, for both their novelty and their commitment to continuing quality comics on a monthly basis. 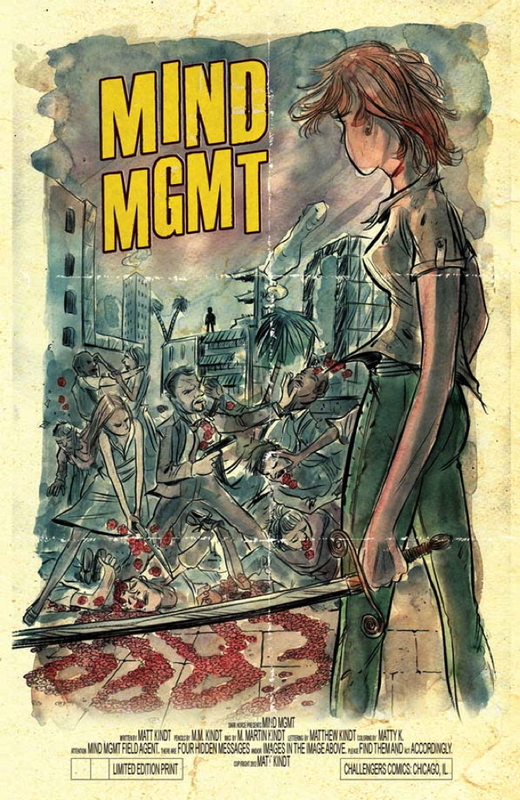 Mind MGMT is far and away my favorite monthly title. I came on a few months late, but fortunately my local comic book shop (shout out to Acme Comics in Greensboro, NC!) was able to hook me up with the first few issues I missed. Every time a new issue comes out, I devour it — usually reading it not twice, but three times. This is well worth the price of admission and I love digging into the multiple layers.